FLORENCE - The Pinal County Board of Supervisors was pleased to learn that Fitch Ratings has upgraded the county from AA- to AA. The improved rating means that any bonding the county secures in the future will have lower interest payments. Currently, Pinal County has four bonds, these bonds are financing projects throughout the county. "This is very good news coming from Fitch," stated Chairman Todd House. "When you look at Fitch's reasoning for improving our bond rating it is our positioning to participate in the regional economic expansion currently underway. We are leading the way in Arizona when it comes to economic development and it's paying off." The report from Fitch points out that the county has been diversifying its economy for the past decade from mining and agriculture to other sectors like trade, transportation and utilities along with professional and business services. "We've worked extremely hard on developing a strategy for the future," said Vice-Chairman Anthony Smith. "One focus of that strategy is economic development and improving government services. The analysts at Fitch Ratings obviously saw the great strides we are making when it comes to making Pinal County a more business friendly environment. That is evidenced by six straight years of growth when it comes to sales tax revenues." Pinal County has experienced no shortage of companies interested in relocating or starting their operations within its borders. Recent announcements by Attessa to build its new multi-use racing facility just south of Casa Grande and Case New Holland relocating to Pinal County has made this area one of the fastest growing in not only Arizona, but the nation as well. "When it comes to policy-making, this Board has been consistent in its goal to bring in new business opportunities for our residents," said County Manager Greg Stanley. "The staff has been given their direction and has embraced this challenge. We are all working well at making local government not only effective, but efficient with the taxpayer dollars. Looking at the report, Fitch saw this and remarked on our conservative budgeting." Getting a flu vaccine every year is the first and best way to protect yourself and your family from the flu. Here are a few other new things to know this flu season. This flu season, get expert insight and updates on your twitter feed. 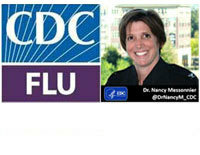 Follow @CDCFlu and @DrNancyM_CDC on twitter for information on immunizations, respiratory diseases, flu viruses, flu season, and much more! Fight the flu this season by getting yourself and your loved ones vaccinated against the flu! 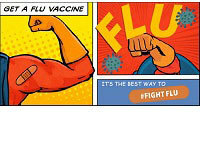 You can help spread the word and support CDC's Thunderclap by sharing this flu vaccination message and hashtag on your social media channels. Pinal County Town Hall Focuses On Linking Transportation: Paving the Way to Economic Growth! "Linking Transportation: Paving the Way to Economic Growth" is the theme for the 29th Annual Pinal County Town Hall, Thursday October 6th. Approximately 150 delegates are expected to attend the informative sessions being held at Robson Ranch located at 5750 N. Robson Blvd., Eloy, Arizona. Pinal County Town Hall's primary sponsor each year is the Pinal County Board of Supervisors. Supervisor Anthony Smith, Dist. 4, represents the Board on the Pinal County Town Hall Advisory Committee. The Advisory Committee is composed of representatives from throughout Pinal County who meet monthly to work out details for the event. During this year's Town Hall, Supervisor Todd House, Dist. 5, will discuss the Pinal Regional Transportation Authority (RTA) along with other elected officials on the Pinal RTA Panel. The overall goal of the sessions, according to Town Hall Director, Maxine Brown, is "to equip citizens with information and knowledge to understand how Pinal County transportation is funded, how to get involved in obtaining local projects, what is a Regional Transportation Authority (RTA), and how it all links with the economic health and growth of Pinal County. We will hear from federal, state and local transportation officials, representatives from business, economic developers, and regional planners. The Pinal County Town Hall believes delegates will be able to return to their community with a better understanding of local transportation and economic growth of the county." Key note speakers are: Mary Peters, former U.S. Secretary of Transportation (2006 - 2009) and Victor Mendez, Deputy Secretary, U.S. Department of Transportation since 2014 (invited). Pinal County Town Hall's Wayne G. Gerken Youth Scholarship will be awarded during the event. Town Hall offers students the opportunity to attend the event and participate in a round-table discussion to apply for the scholarship. Town Hall Advisory Committee Vice-Chair, Donna McBride in discussing the youth component of the program, stated: "Town Hall has provided a venue for young people to come together with local leaders. Helping them learn about important issues such as issues related to transportation and economic growth will help create the next generation of leaders." Pinal County Town Hall Advisory Committee Chair, Sandie Smith, explained: "I have attended all 28 Town Halls. These events have been instrumental in bringing together diversified interests to focus on timely, relevant issues vital to Pinal County and its citizens. This focus is then transformed into information taken back to local communities for a better understanding of the issue. The networking and friendships formed at these Town Halls are invaluable for forming alliances that will help ensure Pinal County is a place where we can live, work, and play."